Every month or two, the Odyssey Writing Workshop releases new podcasts created from excerpts from lectures given by guest writers, editors, and agents at the Odyssey Writing Workshop. Each one is ten to fifteen minutes long. 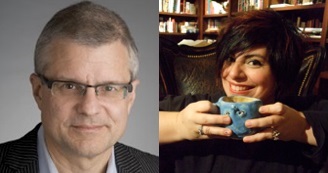 Our two newest podcasts feature authors and guest lecturers Alexander Jablokov (Brain Thief), from the 2014 summer workshop, and Holly Black (The Spiderwick Chronicles), from the 2013 summer workshop. Alexander discusses how a character functions within a plot, and the many conventions authors use to present believable characters, while Holly explains how to create a magic system. These podcasts and many more are available for free on the Odyssey Podcast page at http://www.sff.net/odyssey/podcasts.html. Here you may browse and download podcasts, or subscribe to podcasts so you automatically receive them upon release. Odyssey Podcasts can also be found in the iTunes store (for free): https://itunes.apple.com/podcast/odyssey-sf-f-writing-workshop/id213992784?mt=2. Lane Robins was born in Miami, Florida, the daughter of two scientists, and grew up as the first human member of their menagerie. When it came time for a career, it was a hard choice between veterinarian and writer. It turned out to be far more fun to write about blood than to work with it. 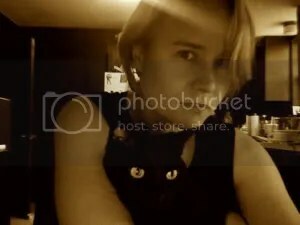 She attended Odyssey in 1999, and currently lives in Lawrence, Kansas, with an ever-fluctuating number of dogs and cats. She is the author of The Antyre Chronicles (Maledicte and Kings & Assassins) published by Del Rey. Under the name Lyn Benedict, she is writing the Shadows Inquiries series for Ace, which includes Sins & Shadows, Ghosts & Echoes, and the just-released Gods & Monsters. You can visit Lane’s website at www.lanerobins.com. Lane Robins is a 1999 graduate of Odyssey. She was born in Miami, Florida, the daughter of two scientists, and grew up as the first human member of their menagerie. When it came time for a career, it was a hard choice between veterinarian and writer. It turned out to be far more fun to write about blood than to work with it. She received her bachelor’s of arts degree in creative writing from Beloit College and has attended the CSSF Novel Workshop based at the University of Kansas. She currently lives in Lawrence, Kansas, with an ever-fluctuating number of dogs and cats. I was working as a retail manager in a dying outlet mall. The stores were pulling out right and left and I had no staff at all. The clerks in the stores that remained had nothing better to do than wander back and forth talking. It was a very bizarre time, but it also gave me a great chunk of time to write. I also worked part-time in a bookstore, shelving books, which gave me lots of time to think. So basically, I worked on stories while people paid me to stand around. When I went home at night, I put my scribbles into the computer. On my days off, I sent stories out. What made you decide to attend the Odyssey Writing Workshop? I was getting really frustrated and I felt like I had stalled in my writing. I knew something was wrong, but couldn’t put my finger on it. I needed fresh eyes and I needed instruction. I heard about Odyssey and thought that it sounded like it might be exactly what I needed. That Odyssey was six weeks was an extra plus for me. I was beginning to have doubts about my dedication to writing–it’s hard and sometimes lonely work. I figured if I couldn’t work on writing, critiquing, and revising non-stop for six weeks, then I should stop wasting my time, go back to school and get a more marketable degree. Turned out I loved spending all my focus on writing and was energized at the end of the workshop. I’ve always been an epiphany learner, muddling along until that bolt of lightning clears my head and makes me go, “Oh, I get it!” Odyssey was like being in a lightning storm, often overwhelming, insanely useful. In the first week, I learned what a POV (point of view) violation was and to stop doing it. I learned what story structure was and that I didn’t have it. I learned that stories should have a reason for existing beyond being a “cool idea.” I learned that plots should make sense both as you read the story and when you thought about it afterward. I think the only things I had going for me when I went in were basic grammar skills and some gift for characterization. Can you describe your Odyssey experience? What surprised you most about Odyssey? I had a lot of fun at Odyssey; it was like some bizarre ideal summer camp, except without all the camping. Still had the crazy squirrels though. It was scaldingly hot and we kept the front and back doors open to our little townhouse. We created a squirrel shortcut–they were always running through the first floor. Weird, but entertaining. What surprised me most was how helpful critiquing other people’s stories were. I’d sit in the room, read stories that felt not-quite-right and see some of the same flaws that were pointed out in my stories. Critiquing as a whole turned out to be invaluable: it taught me how to recognize the flaws in my own work without depending on someone else to point them out. Listening to critiques on other workshoppers’ stories was also incredibly helpful because I could see not only the problems identified, but hear suggestions on how to fix them, without having the emotional response of it being my work critiqued. My personal knee-jerk response to critiques on my own work is a “No, you’re wrong!” which is why I’ve learned to just listen, take notes, then sit down later and really consider what was suggested. When and how did you make your first sale? I’m bad with dates, but my first sale was actually a poem, which is crazy because I don’t write poetry. It was “Villanelle by Moonlight” published in Weird Tales. It was actually a very painful experience! I had been out rollerblading, tripped, slaughtered myself on a cement hill, came home limping horribly, checked the mailbox, found the acceptance letter, and started leaping up and down again. Mistake. Ouch. I had a broken wrist and a twisted knee. But I was so happy, I didn’t care. The first story I sold was to the now-defunct Fortean Bureau, a comic piece about gremlins. The editor, Jeremy Tolbert, requested a rewrite and guided me through that process. These days I’m concentrating on novels and meeting deadlines (trickier than you think). 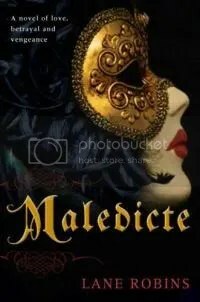 Maledicte, the first book I wrote, went through what seemed like a zillion drafts. I wrote the thing without an outline of any kind, without any real idea of where the novel was going when I began it. I had to revise it three times before I wasn’t ashamed to show it to anyone; then I hit up some of my OdFellows [Odyssey graduates] to critique it, revised it again. After that, my agent gave me a revision letter, and then I revised it once more when I got the editorial letter. I honestly haven’t read that book since it hit print. Now, things are a lot different. I make a rough outline so I have goal posts to aim for, then do a detailed outline for the first five chapters. Write those, outline the next five, and so on, until I have a draft. If I’m not butting up against deadline, I tend to set the draft aside for a little bit to get some distance. Then I come back with a revision checklist and start going through it again. I’ve built this list up over several years, trying to hit the weak spots I see in my writing, the same mistakes I make over and over and over again. It’s probably 70 percent of time spent writing, 20 percent revising, and 10 percent dealing with editorial requests, copy-editing, and proofing. Sad thing is: each book I write seems to have a new and appalling weakness. I think I’d have to say pacing, currently. I just went back and retooled the first third of the novel I’m working on because the plot I’d outlined allowed the protagonist to learn too much, too quickly. I think I’m going to be struggling with pacing for a while. 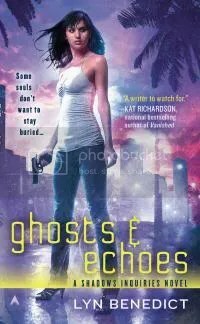 You write under two names: Lane Robins and Lyn Benedict (for your Shadows Inquiries, urban fantasy series). What would you say would be the biggest difference between those two personas? Time. Lyn Benedict writes urban fantasy. The modern setting, modern dialogue, and a familiar world means smaller quantities of research. Lane Robins gets to write second world fantasy which means: tons of research into political analogues of what I want, extremely picky setting work–I don’t want to spend five pages describing a single place, but when you’re in another world, you can’t count on the reader filling in a blank the way you want. And then there’s dialogue. In Maledicte, I spent an inordinate amount of time dealing with dialogue, trying to stamp out any anachronism, looking up origins of words. It was all fun, but time-consuming. For second world fantasies, I’ll end up with a much longer list of research topics. As the daughter of two scientists, how did you find a creative outlet? I didn’t really have a problem. My mother’s a double-threat, an MFA as well as a PhD; she’s a sculptor. My father’s sort of a renaissance guy. Everything interests him, and he has a huge love for literature. It’s sort of a family joke that my taste for dark fantasy is all his fault, but he used to read me Poe in the crib. He also gave me Have Spacesuit–Will Travel, and Starman Jones. Both of them put up with my voracious reading, even encouraged it. I don’t think they were surprised at all when I started writing my own stories. As a graduate of the Odyssey Writing Workshop, what do you think is the most important advice you can give to developing writers? Two things have helped me enormously. 1) Be persistent. 2) Remember to enjoy yourself. Whenever I get all stressed, I like to stop and think what about writing do I like? What keeps me going? For me, I have a huge fondness for revelation scenes. If I’m tired and unhappy with what I’m doing, I’ll stop and write random revelation scenes, the cheesier the better. What? My dog is a superhero? Kind of things. It’s very silly. Right now, I’m working on book three of the Shadows Inquiries, with book four lined up after that. I also have another urban fantasy style novel I’m trying to market, and a second world fantasy I’d really like to write. I figure at this point, I’ve got enough books I want to write to keep me busy for the next six years or so, universe willing.